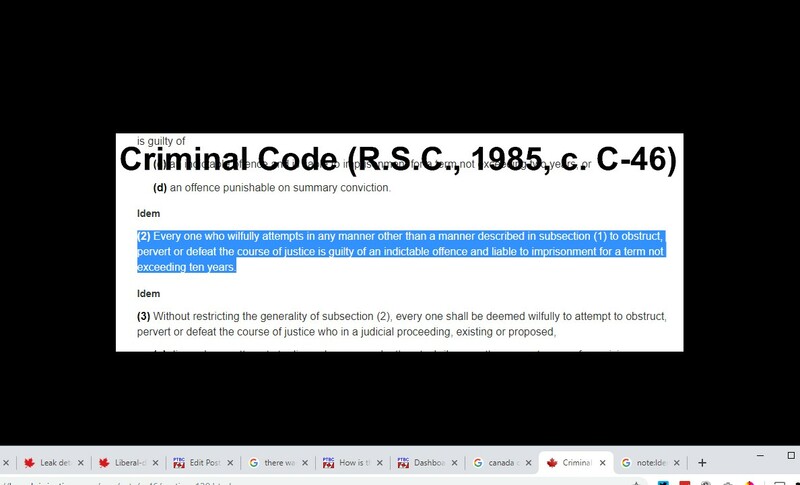 Home Canada How is this not Obstruction of Justice North? How is this not Obstruction of Justice North? Leftists now proclaim, constantly, without evidence, here in Canada and elsewhere, because they got nuthin, that President Trump obstructed justice by blocking the Mueller probe into the now-proven-as-fake Russia/Trump collusion hoax. Of course their grand proclamation is stupid on its face, inasmuch as there was no crime for which to obstruct its justice, Trump did not block the Mueller probe but fully cooperated with it, and the only justice that was obstructed was that which should have been delivered to Donald Trump, his associates, and his entire White House, but was not. So yeah I guess there was obstruction of justice — just not the way you leftists think. But in the white north, no racism intended but hilarious if you were “triggered,” I see Trudeaupian obstruction of justice “hiding,” as one leftists American politician insisted on saying, “in plain sight.” Even the most insouciant and obsequious of the liberal media can see this in Canada. 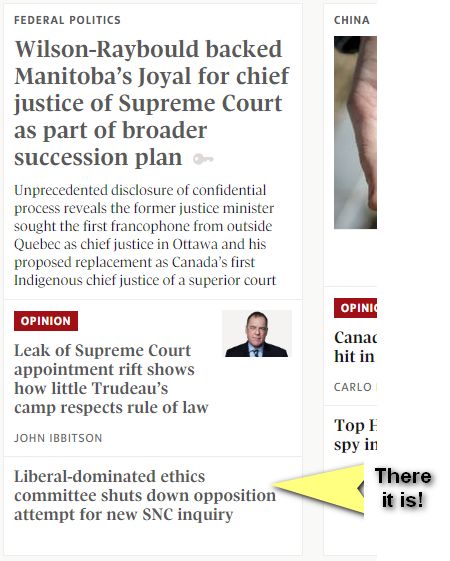 For example, today, the Globe and Mail provides information (as 3rd rate and as scantily as possible — it’s literally the third headline down and in smaller type) that the latest move to cover up the Trudeau/Liberal SNC-Lavalin corruption scandal-gate is the shutting down, by the Liberal-run ethics committee, of an ethics investigation into the scandal. (Of course as I’ve said before, the media don’t call it “the scandal” or anything like what it is, they are calling it “the Ottawa matter” or other such obstructive terms, in order to provide cover for the obviously-obstructing Liberals. Liberal MPs have voted for the second time in a week to close down any further parliamentary inquiry into high-level political interference in the criminal prosecution of Montreal-based SNC-Lavalin, prompting the opposition parties to accuse the Trudeau government of a cover-up. This is literally the definition of “obstruction of justice.” See, it’s “hiding in plain sight.” It takes literally nothing — no evidence — for the media and leftists to call what Trump did — or rather didn’t do — “obstruction of justice.” And yet here it is for them all to see and they somehow miss the opportunity. I don’t expect the Globe and Mail to be like CNN, MSNBC, CBS, etc, and call this “Worse than Hitler,” but what’s going on here, aside from what could arguably be obstruction of justice, is an obstruction of the full, unadulterated truth getting out. They may not be like Hitler, but they look a lot worse than Baghdad Bob. For a media which had absolutely no problem writing or saying the words “hidden agenda” 10,000 or more times and calling every Conservative stumble “[something]-gate,” it’s rather amazing how brazenly they neglect to say what is actually happening vis-a-vis their Liberals. Some Media Slam Trudeau Libs; Some Spew Garbage. LIBERALS. 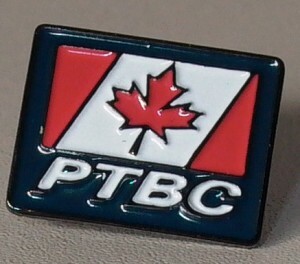 That’s The Root Cause Of The Liberal/SNC-Lavalin Scandal.